The 2017-2018 off-season was a particularly tough one for avid baseball fans. The traditionally hot stove has run cold (for a variety of reasons that have been well covered, as there hasn’t been anything else to cover), leaving us with little to snack on in between the meals of Actual Baseball Games. As such, the handful of M&M’s that is catchers and pitchers reporting to Spring Training feels like a veritable feast for the famished. You might laugh, but my heart skipped beats around the cracks of the bat. With the first Spring Training action officially underway, I figured I’d help assuage the baseball-shaped hole in our lives with a series of articles previewing the 2018 Phillies team. Much like I did last year, I’ll go through the team position by position and take stock of the situation. In 2017, there was a lot uncertainty in terms of the roster – it was very much a fluid situation. This year things are more settled, but still sort of jiggly. 2018 is our Jell-O year. Carlos Santana has a firm grasp on the role of first baseman. The 32-year-old may be a newcomer to the organization (having signed a 3 year/$60 million deal in December), but his offensive production combined with his defensive limitations force Rhys Hoskins off first and into left field. “Offensive production? What kind?”, you may ask. Fair question – he’s new to the Phillies and wasn’t exactly a high profile player. Since 2011, there are 421 players who’ve received regular playing time. Only two have a higher walk rate (Joey Votto and Jose Bautista), both of which have higher strikeout rates. If you’re still reeling from Ryan Howard’s dazzling displays of league leading K’s, rest assured that Santana is very much not that player. Taking a look at the rest of his offensive profile, it’s easy to see why he flew under the radar. His career batting average of .249 would lead most people to underrate him (but not you – you know how often he walks!). His average of 24 home runs per season might have other people raising their eyebrows (you know better though, calmly grasping that walk rate). “Why move Hoskins to Left?”, they’ll say. But you. You know. How does he manage to walk so much? It’s not just good discipline. Santana simply doesn’t swing much – at all. Call him the Anti-Alfaro. Since 2011 (again), Santana has swung at 38.4% of pitches he’s seen. That ranks 11th lowest out of 421 batters. When he does swing, he makes contact at a healthy rate – 81.1% (league average in 2017 was 77.5%). This wait-and-see approach helps him to work counts and avoid striking out. Obviously, it works – he’s been an above average hitter in every single year of his career. Expect Santana to continue the streak in 2018 – he’ll be a good-to-great hitter in 2018, helping to anchor the middle of the rotation alongside Hoskins. Maikel Franco’s sophomore slump continued into a junior… uh… a third year… hmm… turd year? (Is that anything?…The boys are nodding and giving me a thumbs up. So yes, we’ll go with that.) 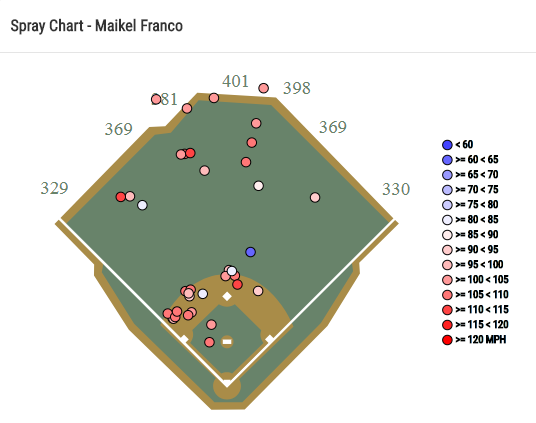 Maikel Franco’s third year/turd year was just about anything but encouraging. Exhibit A: Franco’s 30-game rolling wOBA. wOBA, as I’ve mentioned before, is an all-in-one offensive statistic that weighs every kind of hit/walk/etc. to get an idea of how good a player is. A .320 wOBA is average. 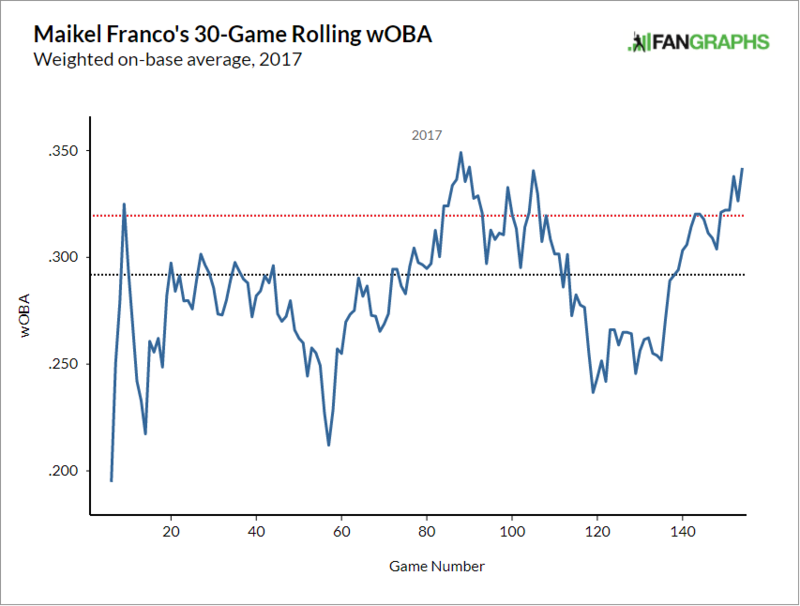 There were few times this season where Franco approached or exceeded “average”. The red line is league average. The black line is Franco’s 2017 average. The black line is on the wrong side of the red line. If you fold in base running, Franco rated as the 7th worst offensive player in baseball. Six of the players worse than him were good defenders, justifying their spots on their respective rosters. Maikel doesn’t have the privilege to say the same – while he’s not a disaster at third, his range limits him to mediocrity. Is there anything for us to be optimistic about? Any advanced stats that say he got unlucky, that the results didn’t follow the process? Surely he isn’t as bad as the surface numbers suggest, right? Well, his xBA is higher than his BA – his BA was an unsightly .230, but his xBA was…. .239. Not much better. While he hits the ball fairly hard (88.7 MPH average exit velocity), he tends to pull balls on the ground. This lets defenders shift and get easy outs. The following chart shows all the batted balls Franco had in 2017 that had a >50% chance of landing for a hit. Each one is color coded by exit velocity. Note the bright red section on the left side of the infield. So what does Franco need to do? Get on board with the fly ball revolution. He hits the ball hard, he pulls the ball, and they go right to waiting defenders. Can’t ground out if you never hit ground balls. *taps forehead* If Franco can begin to elevate the ball, then his game will elevate with it. If 2018 is an encore of his 2017 performance, the Phillies will need to look elsewhere for a long term solution at the hot corner.